Pingu and his family move from their small village to the big city; in which there are many people with many different occupations. The ever-curious Pingu tries to join them at their jobs, but his mischievous side gets the better of him and he ends up messing things up. Pingu in the City is an amazing show with plenty of laughs. The characters are charming and the humor is top notch. The mimicking of the claymation stayed true to the original concept and the lack of dialogue makes this a universally appealing anime with no language barrier. Pingu in the City is very episodic and realistically you could watch any episode in any order back to back as there isn't any real overarching story. This is a simple kids show and a great one at that. Very little shows can capture the charming, carefree nature of children as well as this did. I personally felt this was masterfully done, the simplicity only adds to the overall genius of this show. This show has a variety of simple, easy to understand themes sprinkled throughout each episode and you could come out learning something even if it's a simple lesson it's important. This show isn't for everyone, being a kids show doesn't mean it won't appeal to adults (I mean I certainly enjoyed it) but there is a clear audience in mind and taking that into consideration this clearly not only nails it in that ballpark, it perfectly encapsulates everything a kids show should and ought to be. I highly recommend this show if you enjoy carefree wholesome kid shows that is fairly simple to grasp and understand. Kids will surely enjoy this show, some adults can come to like and appreciate this show as well. Truly a modern-day masterpiece that won't be forgotten. 10/10. Review in brief: Pingu’s surprise anime reboot, while a resounding hit with pre-established fans of the European claymation series, is difficult to recommend to newcomers despite being fairly entertaining in its own right. Though this short series provides simple fun, it’s a definitive step down from the older claymation seasons. That said, if you’re already a fan you’ll probably like Pingu in the City just fine. Review in full: Though this review is solely about Pingu in the City, it would be difficult to truly understand what’s right or wrong about it without looking back to its source. Originating from Switzerland in 1990, Pingu gained international acclaim as a children’s claymation series that made fantastic use of its medium to present zany yet touching short stories about the eponymous penguin. The international aspect was reinforced by how it told itself though expression rather than verbal dialogue, allowing characters to morph themselves to convey thoughts & emotion while having them speak “Penguinese”, a silly gibberish language that fit in perfectly with the typically light-hearted nature of the show. Japan was one of the many countries Pingu gained a following in, resulting in a CG anime reboot few saw coming but many became excited for. This reboot is, in a word, alright. Many more descriptive words could be used, but they wouldn’t be completely honest. It’s unfitting in some ways, and yet it’s definitely still Pingu. It’s a little unspirited, yet specific aspects of it were certainly made with spirit. Lacking almost works, but in truth there’s no less going on here than there was before. It’s a whole product for sure, but you could say it’s missing just a couple screws that would have held the whole thing solid. It starts with the production values. The use of CG does an average job of replicating the original claymation, though there is an initial effort to avoid the looser effects from the old show (they start making things a bit looser from the halfway point of the first season but it still isn't the same). At the same time a few odd bits of repeated animation & freeze frames are scattered about, and while giving Pingu transformation sequences was a cute touch it does wear its welcome. In essence, while it clearly looks like Pingu, it doesn’t hold the same expressiveness the original did, which means the plot can’t take advantage of the art style like it had before. At least the Penguinese functions the same and usually does its job well, even if it sounds somewhat different (I swear the chef penguin was made to sound the slightest bit French). There’s little noteworthy music to speak of though. Pingu moving to the city gives the show a new setting but it isn't tapped into all that much. The environment and set pieces are interacted with in ways befitting an explorative children’s show, but nothing about it has to do with being in a city. Most of the jobs & activities Pingu partakes in could have taken place at his old village. Sure, the show can go on without the “city” aspect, but for what is essentially a look into a child’s exploration of his new home it results in many missed opportunities, especially as Pingu isn’t performing a new job every episode (in fact most of his jobs are recycled 2 times or more). The city itself also feels awfully generic in the end, though part of it is also how static it is from an artistic standpoint. If you put humans in this setting I’d almost think I was looking at Soviet Murmansk after 5 buckets of pastel paint were evenly distributed. The humor is pretty much in the same vein as the older Pingu episodes but it's not quite as quirky as the original due to its much more formulaic nature (Pingu observes job, gets job, does job, has job-related conflict, creatively resolves conflict or the episode ends before then). The show still has its moments, especially the first few episodes with the chef penguin (probably because Pingu does the silliest things to him, albeit unintentionally). Some episodes don't follow this formula (such as the racing and babysitting episodes) and they are usually more enjoyable as they actually explore things that fit the characters and the concept of children exploring rather than some random job Pingu gets a sudden interest in (which, again, could have worked fine if he didn’t repeat jobs so often). It honestly isn’t enough to give the show consistent charm. It’s almost frustrating to watch this season despite its occasionally down-to-earth episodes when it’s usually just one or two of the characters messing around with a job they were curious about for six minutes before the main joke happens and the credits roll. For the new viewer, they’ll likely find a couple episodes charming and simply see the rest as a standard kid’s show. Fortunately the old characters that appear are themselves and the new ones fit in quite well. Pingu himself is a big part of what makes his show enjoyable; his impulsive & childish nature leads him into many crazy situations but he is also hardworking and well-meaning, so even if his approaches to problems are less-than orthodox he generally manages to solve them through genuine effort, even though he rarely takes an optimal path to it and it doesn’t always work out. His interactions with his little sister Pinga bring out both of Pingu’s sides in a strong way, further reinforcing his immature yet admirable character. Robby the Seal is like a foil to Pingu, usually fooling around and just looking for a good time, but he has a good chemistry with Pingu and they always find a way to help each other in the end. It’s a shame his appearances are limited and are mostly just in the later episodes. Most of the other characters have a few defining traits, which considering the limited screen-time they receive is enough to serve their roles and occasionally bring interesting moments to the table on their own accord. A little more expressive movement would have gone a long way towards having a consistently memorable cast though, and while there are definitely stand-out characters, the cast as a whole isn’t able to make the city come to life by themselves. Verdict: Pingu is back, but this season just isn’t quite the same. At times it has a genuine charm to it but when the majority of episodes can be chalked up to “standard fare” despite occasional quirks it’s time to take off the nostalgia goggles and be honest with what it is. I still found Pingu in the City enjoyable, but it’s not consistently good like Pingu was for me in the past. Side note: The second season addressed most of the points made in this review and is overall a much better showing. I could recommend the entire Pingu in the City series on account of the second season alone. The above review of the first season is untouched from before then though, and will remain as such because standalone all of its points still apply to its season. My review of the second season is also standalone, but in the context of it following this season of Pingu in the City versus this review following the claymation series. Just imagine over several thousand of years had passed, the human race would have gone extinct ages ago, and the wildlife had taken control over once again, some form of life descended to earth, and discovered the Disney park, now wouldn't they think we human, the previous residents of earth were worshiping Micky mouse, regarding him as a mighty god? well, what would happen if they were to get a copy of the Pingu in the city series? now that would be something to be looking for, wouldn't it? but seriously guys, the series that emerged from our dark nature of memes, and gained most of its popularity from that is our focus for this review, I won't lie when I say, I picked up interest in this show just to take part of the meme community, and was greeted with a whole different experience when watching it. 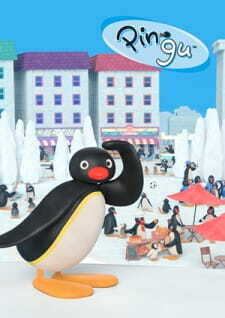 This is going to be, an honest and an unbiased review of the series, “Pingu in the city”. The score in here varies from a person to another, I'm sure if someone else, younger than I am, would have given it a slightly higher score, but as for me, -the viewer, it felt like an easy 6 on the scale of ten, the story, while not completely dull, it follows our protagonist, a young male Penguin called, well, you guessed it, “Pingu”, that goes through his daily life, having fun sometimes, probably working hard in others, struggling like the average kids would. The story focuses more on his relationships with his family and friends, It's very wholesome and family friendly, and honestly, geared more towards a younger audience. Nothing very remarkable or outstanding, it's done all in CG, and surprisingly enough, taking in consideration the context, it's not that bad, you would typically see big-time shows screwing up the CG moments, but not this one. nothing is too overkill or anything, which really helps keep up the peaceful kind of atmosphere to the environment of the story. Long have people complained about the lack of subtitles in this one, but honestly, why would you need any? the whole time, the characters are screaming nonsense, literally, some form of complex jibberish, and on fewer occasions, they would yield “Noot Noooot” very awkwardly, and yet, there is zero misunderstanding when it comes to following the characters' dialogs and interactions, the opening and ending are very, very simple, but do they stick to your memory that easy. What I really loved about this show, is how consistent the main cast is, who said only shows with lots of characters are successful? we don't see many familiar faces, because first, they are all penguins, and look similar to one another, and second, even though the city is so big, everyone seemed to know each other, outside of Pingu's family (which is one of 4 members), you have few of Pingu's friends and close relatives, and that's it. the show is typical, self-centered around Pingu, because, duh, he's the protagonist, but it's his everyday life that makes the cast wider by margins compared to the first episode. Trying to sum this one up, I'd say, I liked the show, I didn't love it nor did I hate it, simply had watched a decent show, where I didn't have a lot of things to complain about (which by the way would find me doing on even the most credible and popular well-written stories), if you overlooked the fact that it looks very childish, it's a really decent show to watch on your spare time. Wow, even I am surprised that this lived up to be worth 7 out of 10 at this point, I'm not going to introduce a lot of people to this show, but for the ones who want something wholesome, here's your pick.